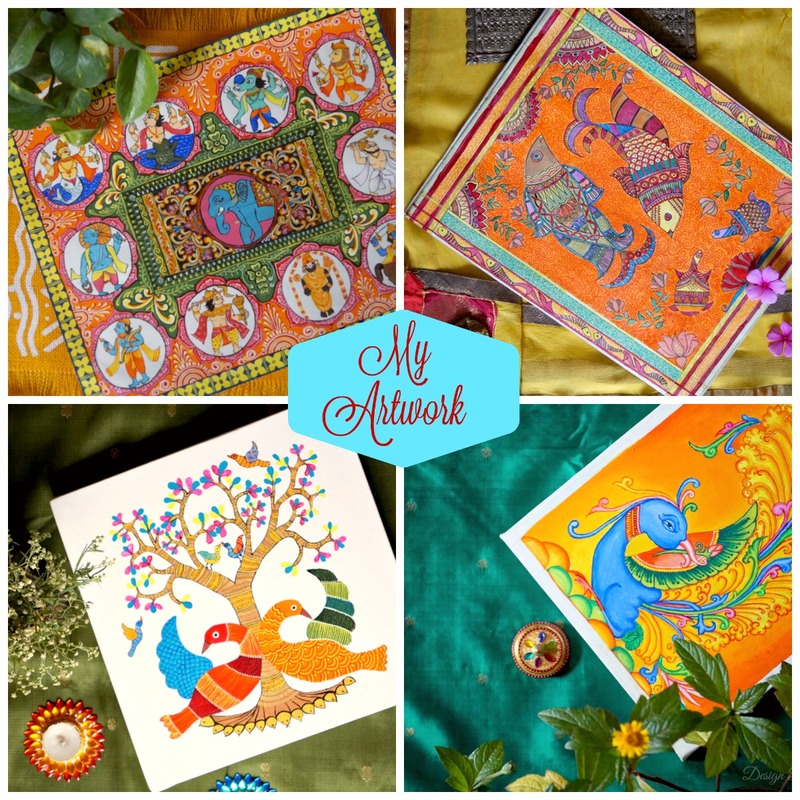 Winter is creeping up on us fast and I am all set to give my home a punch of warm hues. What could be a better place to start with other than a sofa in living room or I should say cushions more precisely. Cushions can instantly add the cheer and warmth to the decor and they are totally transformative. 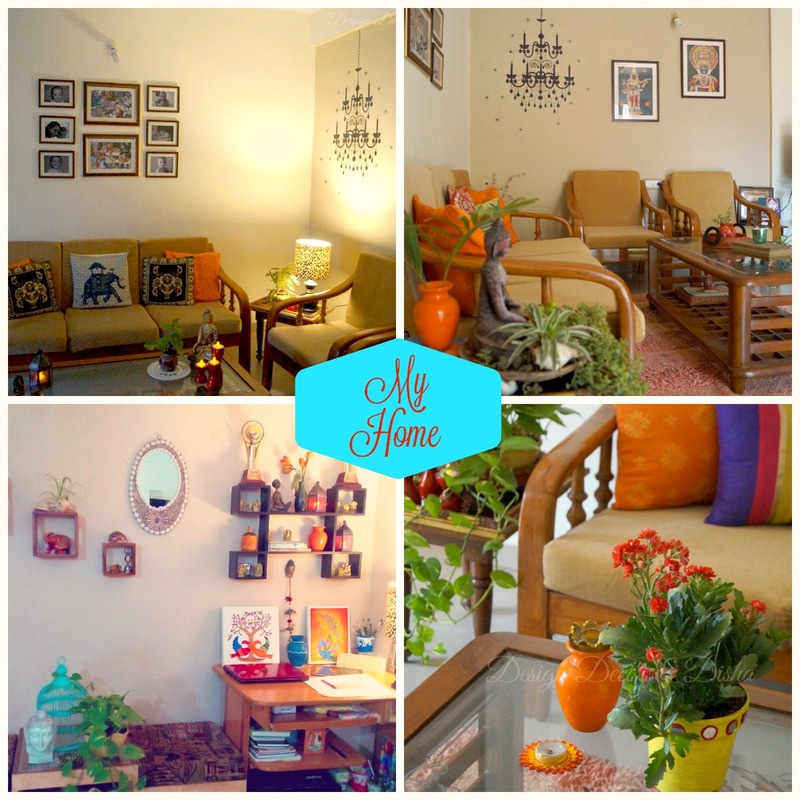 Careful selection of right hues for winters can completely change the look and feel of home. 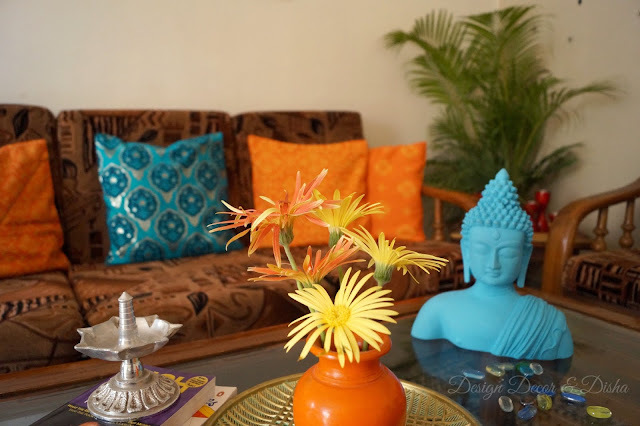 So in association with 'House This' a brand that curates the most fashionable products for home and is now available on Jabong, I bring to you this post on styling a sofa with cushions to beat the winter doldrums. In case, you missed my earlier post on how I used 'House This' duvet cover to give my home a holiday makeover then click here to read it. Sofa styling is all about cushions/throw pillows. Now let's start styling a sofa with cushion covers. I picked all my cushions from 'House This' and below is an image that I created especially for my readers. You can 'Pin' this image for future reference. Hover you mouse over the image, you will see a 'Pin' button, click it and you are done!! Now let's explore all the points one by one. 1. Always start from the outside and use a bigger set of matching cushions of size 22" or 24" I will prefer solid over patterned here as these cushions will set a perfect background for patterned ones. Though you can choose patterned cushions also as I did and it works well too. My first set of 'House This' cushions is 100% cotton in ochre color with all over pattern in yellow. The color sets a perfect mood for winters. 2. Layer the second set of matching cushions of size 16" and here I'll prefer patterned ones to create a perfect balance. 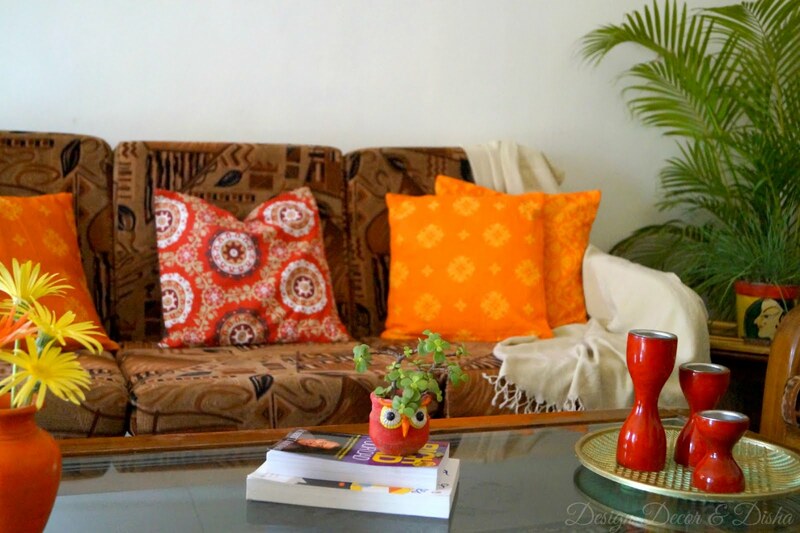 Try to co-ordinate the colors of patterned and solid cushions for a cohesive look. 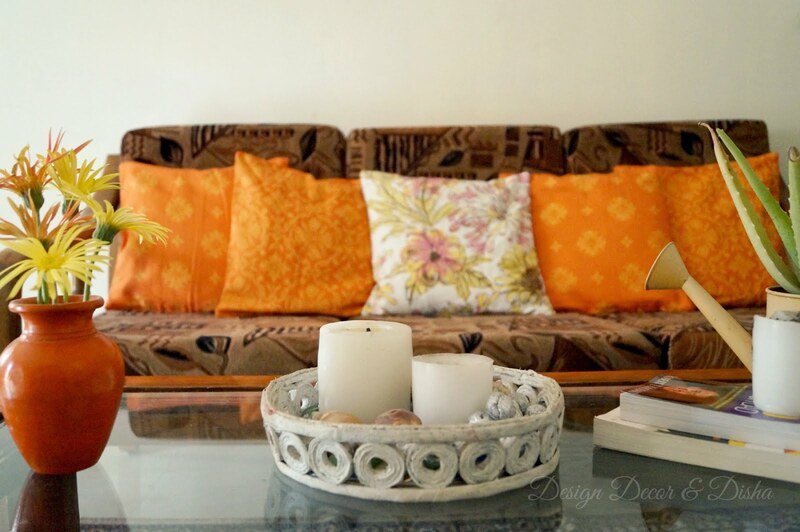 My second set of 'House This' cushions here is again 100% cotton in orange color with yellow delft pattern. I chose warm hues to bring some warmth in my home and to avoid winter blues. 3. Now place an accent pillow in the middle and try to blend its color well with end pillows and the surrounding accessories for pulled together look. This cushion can be of any size ranging from 12" to 16" and any shape like lumber pillow, bolster, round pillow or square one. I chose 'House This' Suzani printed cushion in red to add a pop of color. I paired it with matching accessories on the coffee table for a cohesive look. 2-2-1 ratio is the most visually appealing. 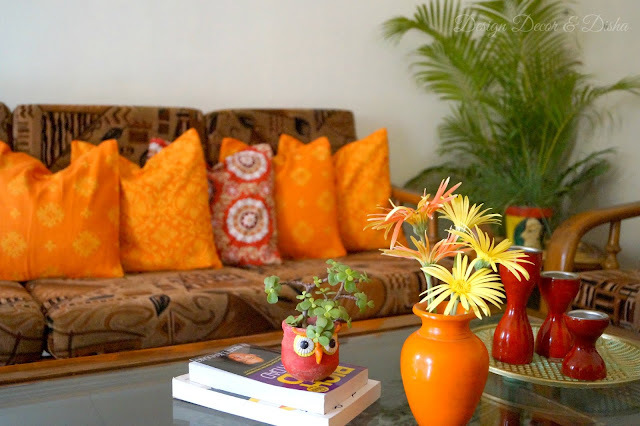 Keep the number of cushions odd for an appealing arrangement of cushions. Accessorize coffee table to complement the color scheme of cushions. Here in the below image, I not only changed the accent pillow but also the arrangement of cushions and coffee table accessories. This blossom printed white and pink 'House This' cushion is to tone down the warm hues a bit. 'Mix and match' is the perfect formula to style a sofa with cushions. Mix lots of colors and patterns and try to match them. Turquoise being my favorite color, it has to be there on my sofa no matter whether I am decorating for winters and this color falls in the category of cool colors. 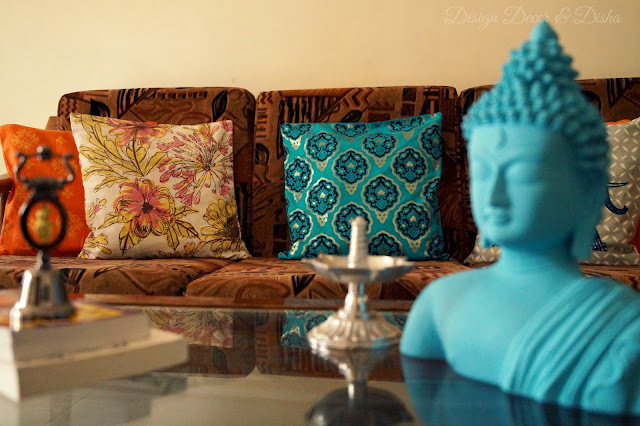 I mixed it with suzani and delft patterns and matched its color with Buddha and throw to tie things together. Mix and match I said and that's what I did here. 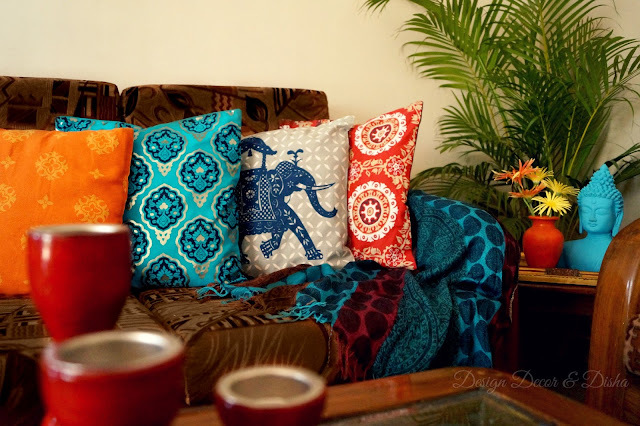 Mixed the colors and patterns and matched them with other accessories like delft pattern on cushions are blending well with the patterns on throw and elephant kept on coffee table books is complementing elephant cushion. 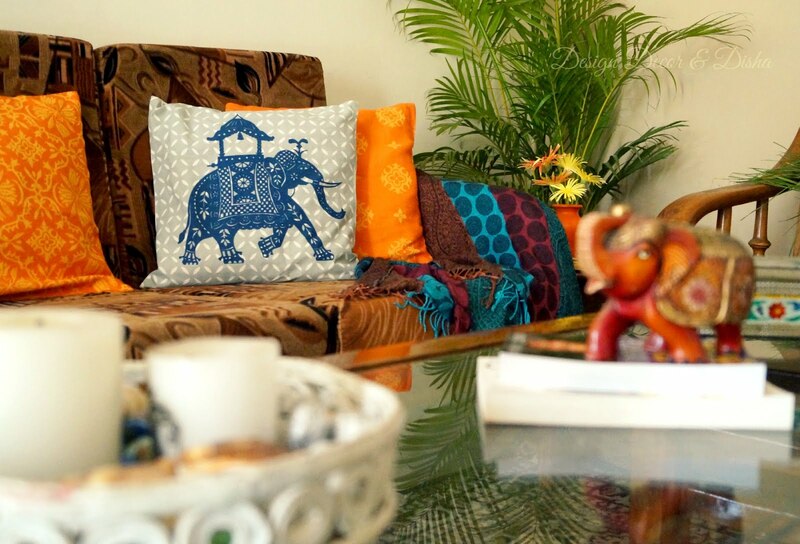 My turquoise 'House This' cushion has darbaar buti on it with silver outlines, I paired it with gray darbaar elephant and white blossom cushions. 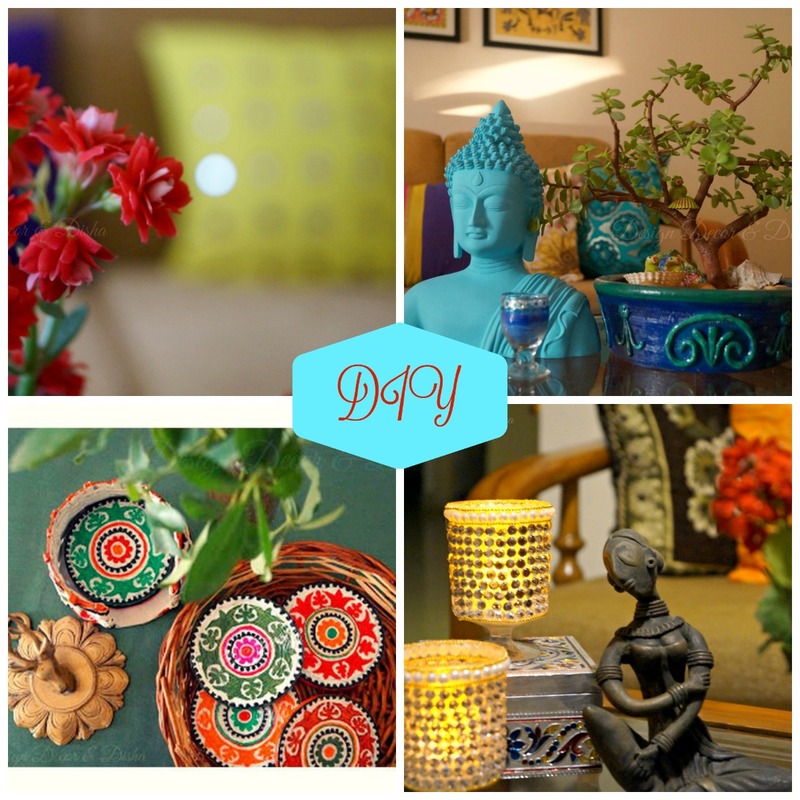 Turquoise Buddha and silver diya are complementing each other. Turquoise and orange is the color combination that works best without any fail. So amidst a lot of ochres and yellows I used turquoise as an accent color. 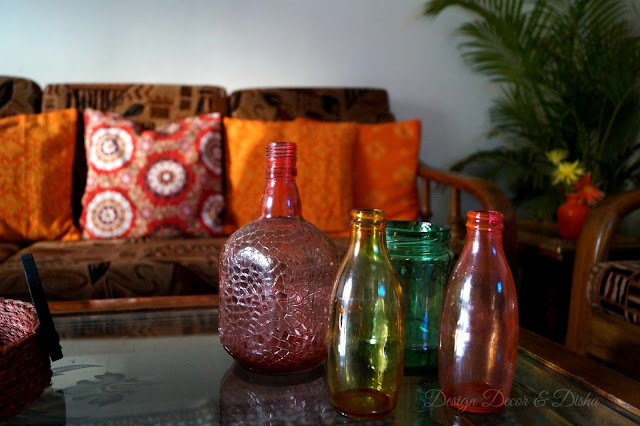 Well, to give company to my beautiful cushions I stained few glass bottles in warm hues and clubbed them together on the coffee table for a perfect cohesive look. Things look good and eye pleasing if they are beautifully color coordinated. House This is my go-to online destination when it comes to buying home furnishings. I will show you more in coming days. Till then you check out what 'House this' is offering right now on Jabong. Coming up next is something about 'Christmas'. Yay!! finally, I am in a holiday mood. Stay tuned! !